We all have magical powers hidden in the secret realm of our genes. Imagine a distant future where such powers have emerged through natural and directed genetic evolution. The Lightriders and Wizzen (wizard-engineers) have blended this magic with science and religion to create a universe where Light is a tool, a weapon, and perhaps a god. 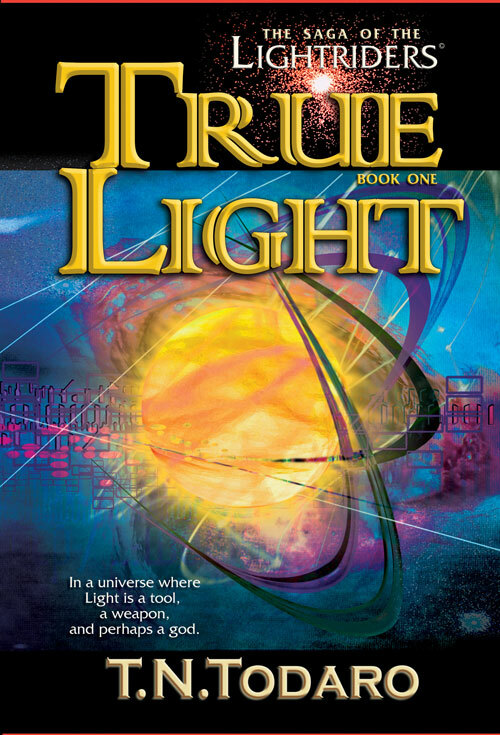 True Light©, Book One of the Saga of the Lightriders, begins the epic struggle between the Protectors of the Infinite Light and the Demon Wielder for the universe of the United Sentient Beings. A Protector of the Infinite Light is murdered and his son is serious injured. He awakens in the infirmary of Wizzen B’Obadine Pelucidor with the uniform and light-wand of an apprentice Lightrider, but no memory of his identity. The spirit of a great man appears to reveal he is the True Light and destined to prevent the Demon Wielder from escaping its eternal prison and ending the dominion of Light. The apprentice Lightrider is attacked by Kr’ill assassins and forced to flee by Lightbridge to the Academa on the Rings of M’rrr, the school in the stars where the laws of nature and magic are taught and improved upon. He learns that he is Jonas Goodwill, and accused of murdering his famous father. To find the real killer, Jonas seeks the help of an alien Grand Wizzen, a warrior-archaeologist, a schoolmate, and a precocious griffin. He travels to the ruined planet of an ancient civilization, to the volcano of Zucchetto protected by an insane sorcerer and fire-breathing trollons, to an asteroid field of magical moonstones, and finally to a space station where an interstellar battle is raging that only he can end.